There’s always a problem in Magic: The Gathering, or a number of problems, or a cloud of problems, but there are some ideas, some lightning rods for people’s opinions. Let’s talk about one of those problems, and that is the Boros Problem In Commander. If you’re not familiar, Boros refers to the Boros Guild of Ravnica, and is used as a shorthand for any red-white deck. The problem is that in the environment of Commander and Elder Dragon Highlander, this colour combination is perceived as having vulnerabilities that no other colour combination has, and that needs addressing through design. Note that this colour combination has problems that it’s said that even the decks lacking one or the other colours have, which I don’t think I agree with. First of all, I want to underscore that I think this problem is somewhat overstated. I do find the problem of the deck a little exasperating, and want it fixed, but it’s not as abysmal as some people say in Mark Rosewater’s blog. There is an idea that Boros decks are extremely vulnerable because ‘all they can do’ is attack and block, and their commanders tend to be just big doofuses that, again, attack and block. The big question that comes out of this tends to be card advantage. In standard or smaller environments, red and white tend to be very strong, because red provides the most flexible removal spells in the game, and white is the colour that kind of has the second-best of everything. It’s got the second best enchantment removal, second best artifact removal, second best creature removal (best in some formats). Red gives you threats that range from the small and aggressive and the big and scary, and there are even a lot of interesting cards in the middle. White also provides good threats too, at both the bottom and top end. Red-white is one of the strongest colour pairings in Magic: The Gathering, tuned almost perfectly to the resources of a single opponent with 20 life. That’s not quite how commander works though, which is by definition a multiplayer format, and it’s a singleton format. Multiplayer problems tend to be really diverse. Lots and lots of different things going on, all with different players, and burning down a player’s entire life total as a way to make their problems go away takes a lot of your resources. Also, because it’s a singleton format, even the best white and red cards can only show up once. The solution most people use for these two problems is card draw. Draw enough cards and you’ll see the answers you need, draw enough cards and you’ll be able to spend those resources to beat other players. While this isn’t incorrect it’s a little inelegant for my tastes. Simply put, white can’t have card draw as a regular thing because white is already very, very strong at everything else. When you have board sweepers and spot removal, good threats and the ability to set rules for everyone else at the table, the ability to dig for and get more of those cards tends to be really good. Most of the time when white has been strongest in standard environments it’s because it’s paired with a colour that can use its cards to get a lot of advantage, or has some way to draw cards. Like back in Onslaught, when white control could just cycle through its deck to get its Wrath of Gods and Akroma’s Vengeances. Red does have a kind of card draw, but it tends to be what we call impulsive card draw. Some examples of this include Abbot of Keral Keep and Chandra, Torch of Defiance, which are both quite good cards in their own right. Chandra doesn’t let you get lands, but it’s a less-important thing here. This stuff is great for providing more ways to respond to what’s on the table, but you have to use it now, which means you don’t get to control the timing of the effects. Now, personally, I think this is a great solution and the only problem is dialing in to a level where it’s good enough for commander and redundant enough that people can feel it as a consistant thing in their decks. It does, however, present the philosophical problem that quite a few people have, because it’s not card draw. It’s not blue card draw, usually. I personally feel that the core of this problem is a simple question-and-answer problem. 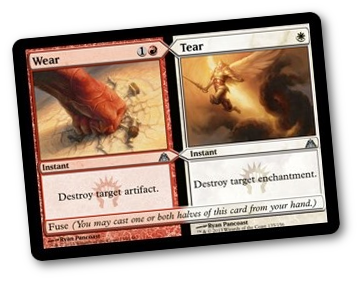 I think the real place to go with red-white that lets them build resources for long games are cards like Wear // Tear here. When I was writing about Magic in my youth, I argued that the colours that were allied with green had their own forms of mana acceleration, where red should have Dark Ritual/Seething Song style effects. White’s acceleration was baked into the cards already: White cards of all stripes were just cheaper, because it was always trying to push efficiency. White should have been, in my opinion, the colour of the barely-enough effect tied to a cantrip, cards like Renewed Faith and Bandage. I think that’s the design space you want to push Boros to make it commander capable without just copying something other colours do. I think you want to print Boros cards that can do double duty, squeeze for extra card advantage. Kill a creature and gain 7 life, for example, in a world of attacking and blocking, is a pretty strong example of a time walk style effect, turning a whole combat step into a waste and trading a card for a card equally. Cantrip removal, seals like Seal of Fire or Seal of Cleansing where casting them impulsively presents a problem for other people to play around. Now, commanders play into this as well. Printing commanders who transform the effect of other spells you play – like Firesong and Sunspeaker – is a really strong way to do it. Even Gisela, Blade of Goldnight is a good example because she needs only the tiniest bit of work to take care of the game on her own, meaning the rest of your deck can be protection, removal, and control responses. The other thing is that Boros needs more of its effects that can get it a few extra cards over your opponents, ideally symmetrically, to be redundant. Wear//Tear is a great card but it’s one card. You can’t make a deck with four or five of them in it. And when you get to deal with bigger groups in multiplayer, trading one card for two cards is the base of what you need a card to do. You need to start getting into the realm of effects that scale – each player sacrifices an enchantment, each player sacrifices an artifact. My main fear is that in our hope to make some cards we like better, and more able to play in our favourite formats, we lose sight of the boundaries that make the game really enjoyable. I don’t think Ezuri’s Predation is a good idea, and I don’t think that a red disenchant would be a good idea. I also don’t think if they printed a red-white Concentrate it would fix any of the problems – because it’s still just one card. For Boros to address this concern you’re going to want redundancy, and that means you need a lot of cards that you can consistantly, meaningfully print, and that won’t represent a deviation or mistake in a year’s time. I’ve edited the Boros logo in this picture. It’s normally a red outline around a white fist, and I’ve inverted that to be a white outline around a red fist. I’m just not wild about the Raised White Fist as imagery with, you know, all the other stuff going on in the world right now.